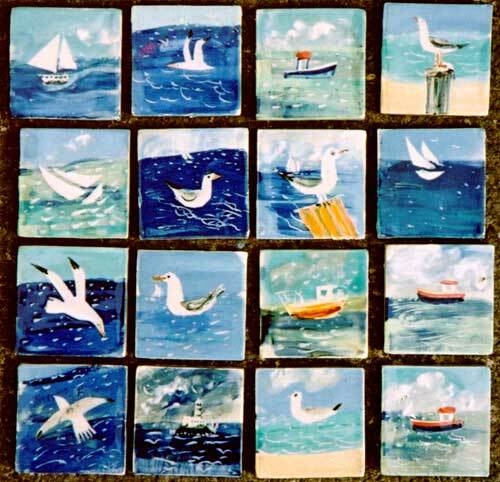 This range designed by Ann features breezy, lively images of boats, beach huts, seagulls and lighthouses. We use a white clay base tile and a combination of techniques which produces a unique effect each time, while keeping to the essential design, look and colours. This range includes murals and decors in 4″ and 2″ size. Sailing boats and fishing boats decors. Bright and breezy, you can smell the salt and feel the spray. Nine designs. You can order these decors in 4″/100mm size. They are suitable for bathrooms and showers. These are actual lighthouses around British and Irish waters. “Beach huts and boats” – can be other sizes and layouts. We make lots more murals!